The Setup Menu contains several different options that will let you configure and customize your Zosi DVR. The Setup Menu is where you will control most of the settings and recordings on your Zosi DVR system. Basic – Customize personal settings, as well as date and time information. Live – Contains settings to change display layouts and colour settings. Record – Set up recording options for your channels. Schedule – Determine the times your cameras will be active. The default is 24/7. Alarm– Configure alarm settings for each channel. Network– View settings related to the DVR’s network connection. User Management – Add and remove users. 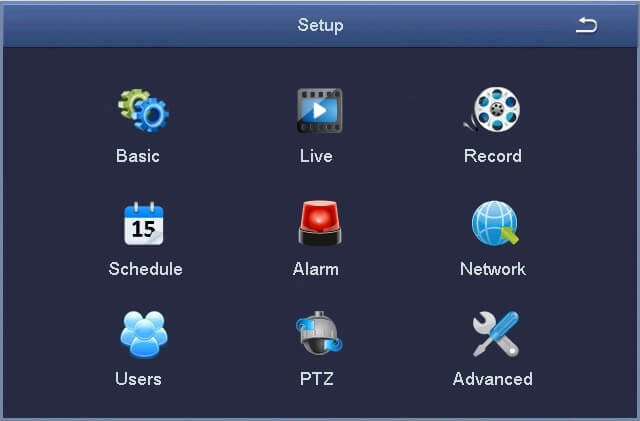 PTZ – Configure the settings for your PTZ camera. Advanced Setup – Reset the DVR to factory default settings and backup your DVR settings to USB.